JMG has worked at various state and private schools as well as in the University sector. 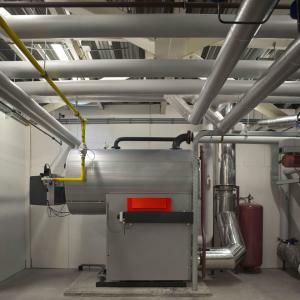 The works have largely comprised the installation of new boilers or updating the often aniquated systems prevalent in many old school buildings. The importance of an efficient boiler system cannot be overstated in schools - the boiler stops working in the winter and the school closes. Likewise in a sector where costs are under constant scrutiny, having an efficient and trustworthy infrastructure is also of paramount importance to reduce uneccessary maintenance. Using modern installation techniques such as Mapress provides an efficient means of installation and maintenance and doesn't require gas torches or flames of any kind to install. All our maintenance and installation work is WRAS approved and conforms to British Standards. "JMG Specialised Engineering, delivered successfully, a complex and fast tracked reactive project for our client’s school premises in Harlow, Essex. JMG’s flexibility and quick mobilisation following a brief notice period, was key to completing the project during a school break. The external, trenched heating services had corroded and significant sections were replaced allowing the school to open on time." Bill Cox, Contracts Manager, Inviron Ltd.